Melon pan is a popular Japanese bread pastry. This bread gets it’s name from it’s iconic cookie crust topping that resembles the skin of melons. For most of my childhood and well into adolescence, I loved anime and manga. Think: Sailor Moon, Hana Yori Dango, Honey and Clover, Bleach, Death Note, etc. (I could go on and on…) During weekends and summer vacations, I’d binge watch episodes and read for hours. And then during college, my roommates and I were totally into Japanese and Korean comedies and dramas. We would stay up well into the early morning, crying and watching these intense and addicting shows and series. And now in present time, thanks to Netflix, Hulu, and Amazon Prime, binge watching shows and movies has become way too easy. What is Japanese Melon Pan? So back to the anime and manga, one food item commonly mentioned in these stories is melon pan. Melon pan, also known as melon bread or melon bun, is simply a sweet bread. It is not melon flavored (although you can find ones that are). It’s named such because of the cookie crust topping that resembles the melon rind. 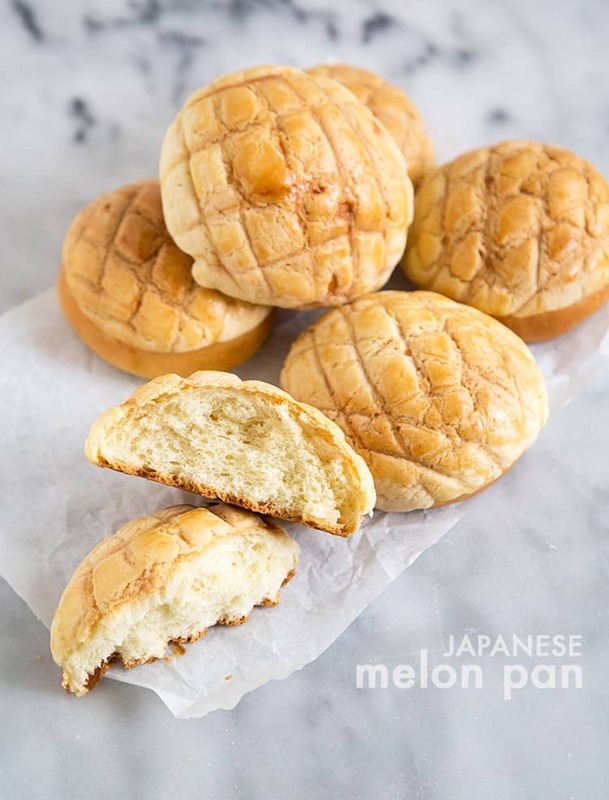 Melon pan is quite similar to pineapple bun, pan dulce and conchas. They all share some sort of cookie crust topping. But more importantly, they’re all delicious snacks. The cookie crust is everything! It provides the perfect texture to complement the soft bread. The topping is crunchy, sweet, and makes me want to eat more and more! The bread dough is fairly straight forward to make. After mixing the dough together, let it rise until it’s doubled in volume. While the dough is resting, make the cookie crust and keep in the fridge until ready to use. Once the dough has risen, divide it into 8 equal parts. I like to use a kitchen scale so the breads rolls are all uniform. Place the bread rolls on a parchment lined baking sheet and cover the bread with plastic wrap. The plastic wrap prevents the dough from drying out and forming unwanted “elephant” skin. Remove the cookie dough from the fridge and divide it into 8 parts. Gently roll out the cookie dough until it is large enough to cover the bread rolls. Place the rolled out cookie dough over the bread rolls. You can completely cover the bread roll in cookie dough, or choose to only cover the top, leaving exposed bread at the bottom. Use a knife to gently score the cookie dough into some sort of criss-cross pattern. It’s this cookie crust topping that gives melon pan it’s name. Cover the bread rolls with plastic wrap once again and let it rest until the rolls have puffed up. 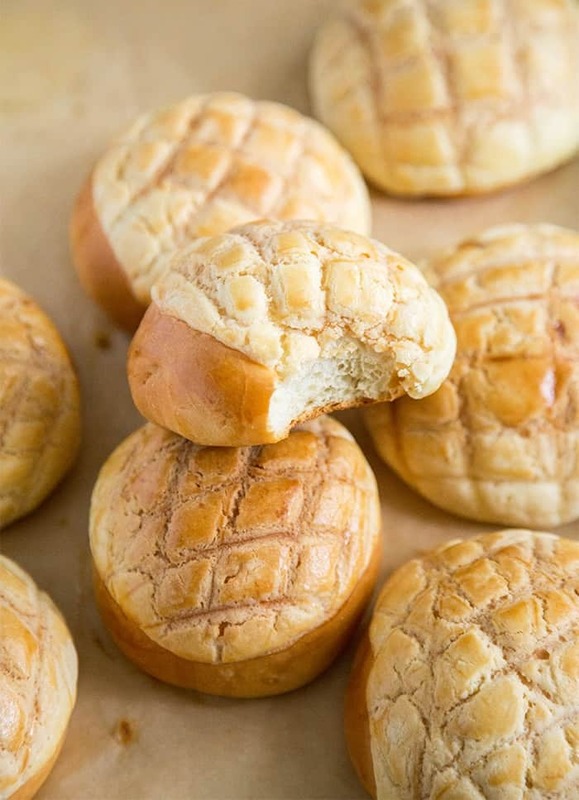 Brush the bread rolls with egg wash and pop them in the oven. 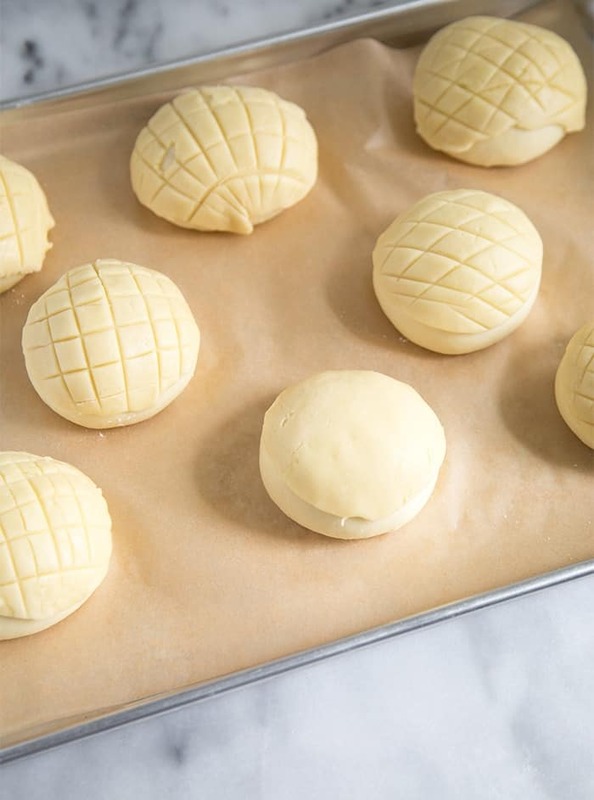 In less than half an hour, you’ll have warm melon pan to enjoy for an sweet afternoon snack. Make a batch of these and get ready to binge watch your favorite shows! Whisk together yeast, warmed milk, and one teaspoon of sugar. Let sit for 5-7 minutes until mixture is bubbly. Pour into the bowl of stand mixer fitted with a hook attachment. Add bread flour, sugar, milk powder, salt and egg mixture. Knead together on low speed. Once dough starts to come together, add softened butter. Continue to mix on low speed until butter has been incorporated. Then increase speed to medium and knead until dough is smooth. Transfer dough to a lightly greased bowl. Cover with plastic wrap and allow to rest at room temperature for one hour until dough has doubled in volume. While dough is resting, making cookie crust topping. Cream together butter and powdered sugar. Once smooth, add salt and flour. Mix together. Then add egg mixture and vanilla. Combine until cookie dough forms. 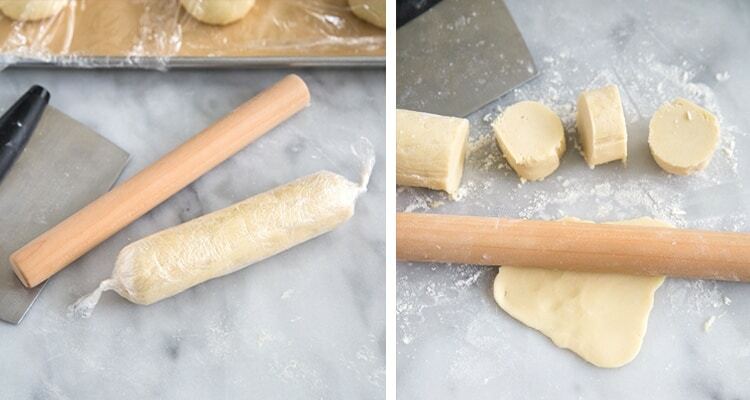 Transfer cookie dough to a piece of plastic wrap. Use the plastic wrap roll the cookie dough into a log. Wrap tightly and keep in the fridge until ready to use. Divide dough into 8 equal parts. Roll dough into rounds and place on a parchment lined baking sheet. 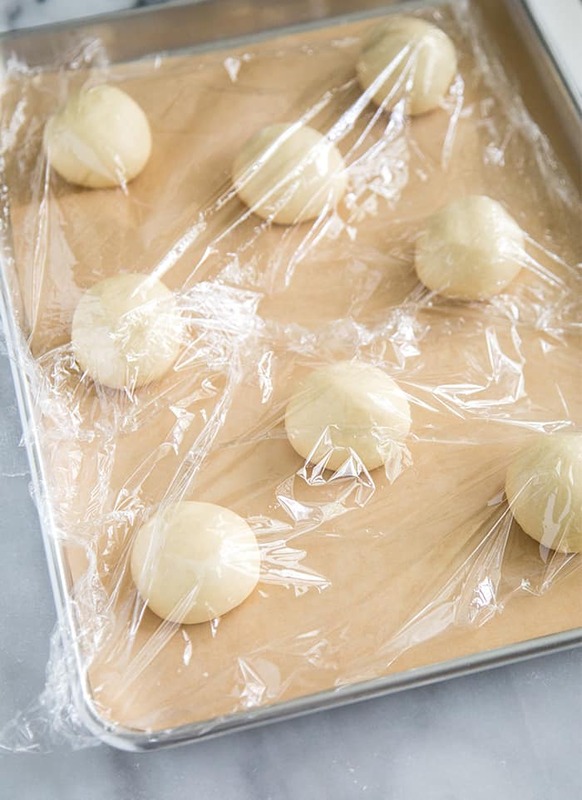 Cover dough balls with plastic wrap to prevent dough from drying out. Take cookie dough out of the fridge. Divide into 8 pieces. Gently roll out the cookie dough until it is large enough to cover the bread rolls. Place cookie dough over bread rolls. Use a knife to gently score the cookie dough into some sort of criss-cross pattern. Cover dough with plastic wrap and allow to rest for 30-45 minutes until bread rolls have puffed up. 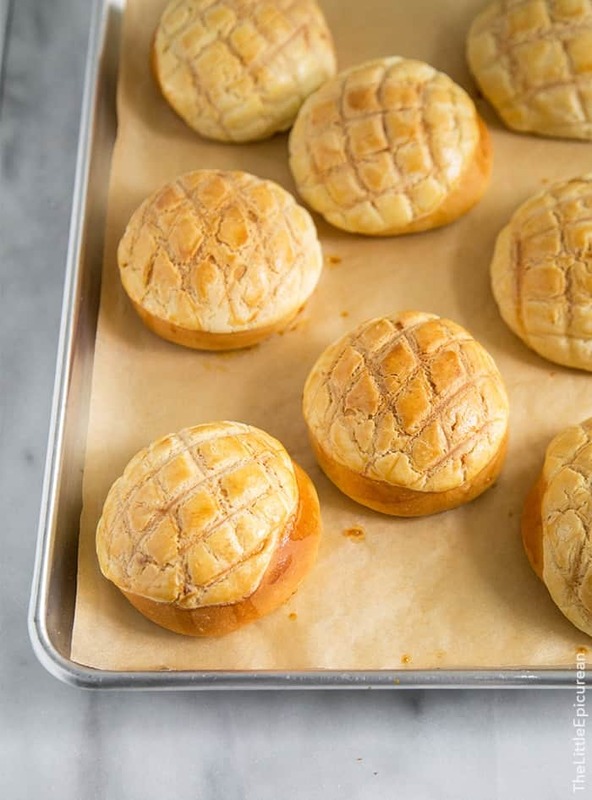 Preheat oven to 350 degrees F. Brush the tops of bread rolls with remaining egg mixture. Bake for 20-25 minutes until fragrant and golden brown. Eat warm or at room temperature. *To make egg mixture: take 2 large eggs and whisk until smooth. This recipe looks like fun. I’ll try this with my son. He’ll love handling the dough and rolling it. I’ve never heard of melon pan before. Sounds delicious though and I know I’m going to like it! I mean, carbs with a crunchy topping – yes please! Thanks for introducing it to me! How cute!! I love bread baking and these just entered my bread to-do list! They look gorgeous! These are just adorable! I love the idea of the ‘cookie crust’ no better descriptive words have ever been used. Going to have to try to make these gluten free so I can eat them soon! Omgness gracious! These are amaaaaazing, great job Maryanne!!! As much as I love bread~if you put these right in front of me I’ll go for the topping and eat the crust off of every single bun, haaha. I’m a weird eater…. This beautiful bread that you made certainly has a better name than the pineapple buns, in my opinion… I love your pictures and this bread looks absolutely enticing! Does it matter much if the milk powder is added or not? If so then are there any good substitutes? I’m still fairly new to cooking so I don’t know this yet. Yes, the milk powder adds flavors and additional protein with the additional moisture from liquid milk. If you don’t include it in the recipe, the finished bread won’t have the same flavor or texture. I’m not aware of any substitutes. I have recently begun reading a lot of manga, and I’ve see Melon Bread mentioned in them quite a few times. I’m so excited to try this recipe out, so I can taste what my favourite manga characters eat! I first learned about melon bread from anime and manga :) Hope you like it! I just made these today and I love them!! Thanks so much for the recipe! Awesome! Thank you for trying out the recipe. I’m so glad you enjoyed it! I was wondering if I could substitute the bread flour with all purpose flour. I love the look of these – will be trying them!